What can I do about my shoulder pain? Shoulder pain and dysfunction can reveal itself in many forms: sharp pain, a pinch, ache, and much more. Regardless of how it feels, it can be a debilitating injury. It can affect your work, sleep, and how you enjoy your free time with friends and family. How does it happen? How did my shoulder pain start? Unless there was an "event" that caused your shoulder pain, most shoulder pain is the result of a slowly developing chronic injury. This occurs when a motion is repeated over and over again, especially with force. The symptoms will be worse with motions that are more forceful or require greater range of motion. This is where we see common shoulder injuries in tennis—with the overhead serve. It can occur during any shot, but the overhead serve requires the greatest amount of function of the shoulder. The muscles that move and stabilize your shoulder all have to stretch out when your arm is overhead. As they become more dysfunctional, they will lose more and more range of motion and strength. 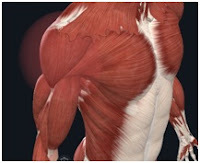 Eventually instead of stretching out, the muscles will actually cause irreversible damage to the shoulder. The affected muscles will cause the top of your rotator cuff to work harder, causing it to degenerate or tear. Instead of stretching, these muscles will compress the joint space in the shoulder causing cartilage damage and an acceleration of arthritis. 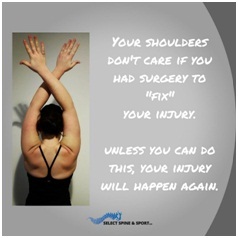 It might just feel like a “pinch” at your shoulder, but there is so much more than that going on in the shoulder! If your problem is from a chronic process, the root of your problem is most likely adhesion. It is the most common, under-diagnosed, and fixable condition in musculoskeletal health. Adhesion occurs when you use a muscle or ligament more than it is prepared to, resulting in an excess of inflammation. When this happens, adhesion will develop on the overused structures. Adhesion is like glue and when it sticks to things it limits their range of motion, saps their strength, and makes symptoms more and more likely. Your body can handle a little bit of adhesion but when it is allowed to build up is when the trouble starts. How do I fix my shoulder? Adhesion is very difficult to fix, but with expert care it can be removed and the shoulder can become pain free again. Is adhesion the ONLY thing that causes pain? Absolutely not! There can be rotator cuff tears, labral tears, separated shoulders, cartilage damage, or arthritis that can complicate shoulder problems. A proper diagnosis can rule these problems in or out with a thorough exam and history. One thing is for sure: an adhesion free shoulder will take pressure off of the joint, slow degeneration, decrease pain and increase function. At our office, we use Manual Adhesion Release to reduce adhesion. MAR is one the most effective treatments for adhesion and we use pre and post-treatment assessments to determine exactly how much improvement each treatment achieved. Unless you measure effectiveness, how does the doctor know if the treatment is working? If the doctor doesn't measure function, the doctor has no clue if when they discharge you the pain will stay away. A pain free shoulder can be one workout away from pain again. Good function=healthy shoulder. Dr. Scott Glidden is a soft-tissue specialist in Milwaukee,WI. His practice focus is chronic unresolved muscle, nerve, and joint problems. You can find more information on him and his practice at selectspineandsport.com.